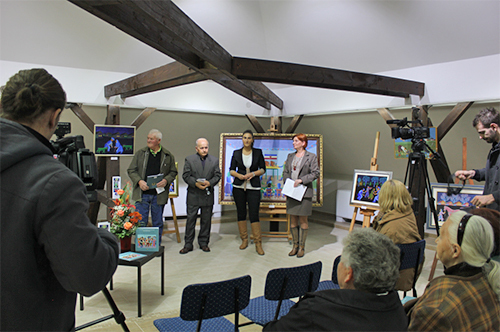 The exhibition entitled The Art of the Slovaks in Kovačica – Jan Knjazovic opened at Gallery of Naïve Art in Kovačica on 10 October 2015 as a part of traditional event October in Kovačica. The exhibition marked the memory of Jan Knjazovic, one of the oldest representatives of Slovak naïve art in Serbia, the founder of the genre in Kovačica. The first solo exhibition of the works of Jan Knjazovic was organised by MNMA in Jagodina in 1981, while this time, the exhibition was organised in cooperation with the similar Gallery in Kovačica. The exhibition was accompanied by a bilingual catalogue published by MNMA, Jagodina. The author of the text and catalogue is Nina Ljubomirović, custodian, MNMA. About forty works of Jan Knjazovic were displayed at exhibition The Art of the Slovaks in Kovačica – Jan Knjazovic, including those owned by MNMA, Jagodina, Gallery in Kovačica and private collections. The exhibited works were done between the seventh and the ninth decades of the twentieth century, thus allowing the insight into overall creative work of this artist. The author of the display is Ana Žolnaj. The exhibition The Art of the Slovaks in Kovačica – Jan Knjazovic was opened by the painter Mihal Povolni, while Marija Raspir, Director of Gallery of Naïve Art in Kovačica, Jan Čeh (the former director of Gallery in Kovačica) and Nina Ljubomirović, custodian at MNMA participated in the opening ceremony. The closest friends of Jan Knjazovic, also painters from Kovačica, Eva Husarik, Ana Knjazovic, Jan Bačur and others were present at the opening. MNMA continues its long-term cooperation with the Gallery in Kovačica with a series of future projects such as the opening of the same exhibition at Novi Sad Institute for Culture of the Slovaks in Vojvodina in December.